Tuesday through Thursday, 4 to 10 p.m.; Friday and Saturday, 4 p.m. to 1 a.m. The recently-opened MamaJuana is going to need a larger parking lot. From the outside, it looks like a small, unassuming mom-and-pop café across Clifford Avenue from Savoia Pastry Shoppe. Upon entering, I pleasantly realized how wrong I was. The first thing I saw was a mural of Dominican musicians Joseito Mateo and Juan Luis Guerra. Directly to the right is a brightly lit L-shaped bar, primed and ready to be stocked (when the liquor license comes through). Elvis Crespo's "Suavamente" thumped throughout the restaurant. I wasn't sure if I wanted to dance or eat, or both. MamaJuana owner Marcos Lopez showed me around the place, which is three times the size it appears from the street. The dining area has plenty of seating for both large and small parties, and to the back is a small stage for a DJ or live band. The large center area is perfect for dancing. MamaJuana is primed to be a favorite weekly merengue spot. The entire area has a modern-yet-cozy feel, with its deep red and dark brown hues pulsing throughout, accented by bright tin panels on one wall and muted fluorescent lighting on another. It looks as much like an upscale lounge in Flushing as it does a family restaurant. Again, I am conflicted as to whether to dance or dine. 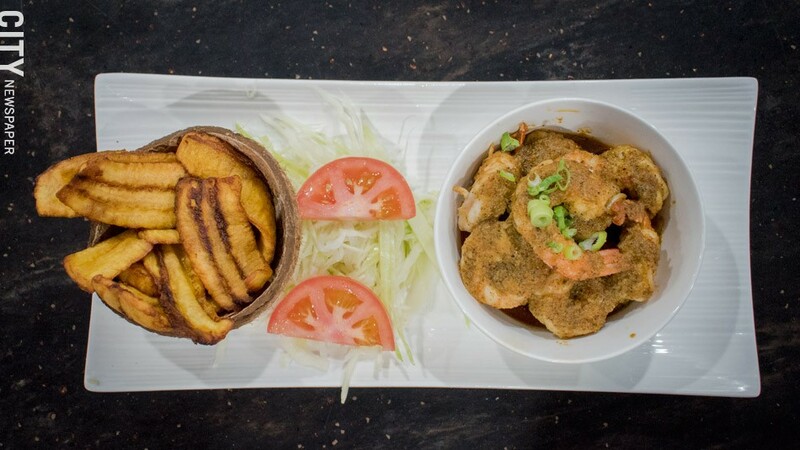 A side of Plátanos Maduros (fried plantains) and Olla de Camarones al Ajillo (Garlic Shrimp Bowl) and at MamaJuana Roc. But Lopez says his main focus at this point is for people to eat. 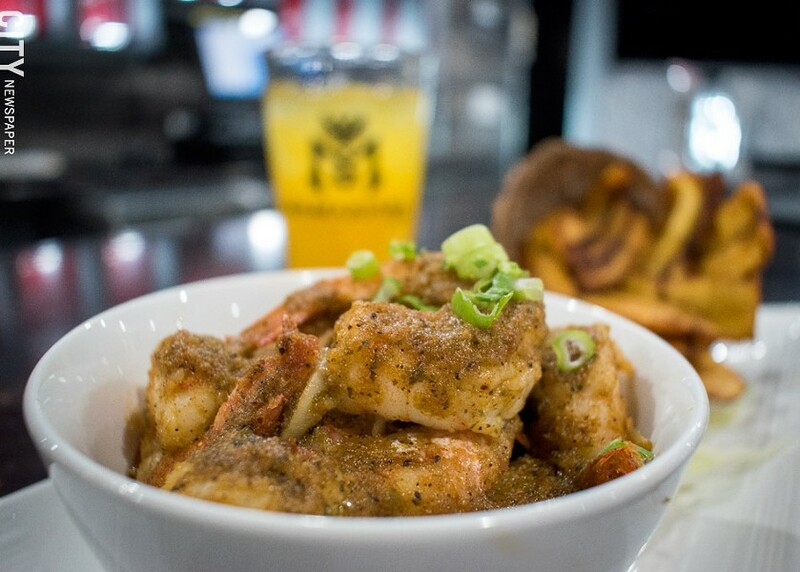 MamaJuana is meant to bring Latin Fusion to Rochester. There are plenty of restaurants in the area that focus on one style of Latinx cuisine, and they are delicious. MamaJuana's goal, Lopez says, is to merge the traditional with the contemporary and make a new culinary palate for the city to enjoy. This is proven by the fact that you can order not only the signature MAMAfungo (plátanos smashed with choice of chicken, pork, or seafood, $10.99 to $14.99), you can also try their take on sushi rolls. The Flower City Roll ($14.99) is good for a healthy appetite. Like a Rochester plate in sushi form, it's a rice roll with salami, fried potato, bucatini pasta, ground rib eye, and smoked Gouda, topped with Rochester meat sauce, diced onions, ketchup and mustard. The MamaJuanaRoc Roll ($13.99) is a white rice and sweet plátano roll with tempura chicken, avocado, and cream cheese, and it is topped with onions, tomato lime aioli, and cilantro. 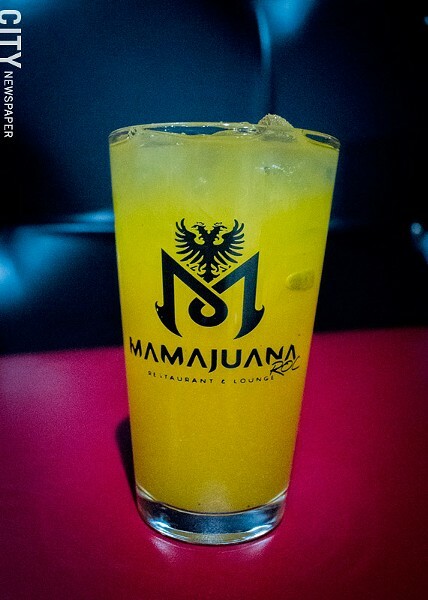 Fresh mango juice from MamaJuana's juice bar. As delectable as those choices were, I opted for the Olla de Camarones al Ajillo (the Garlic Shrimp Bowl, $15.99) and a side of Plátanos Maduros (sweet plantains $4.99). The plátanos were fried precisely the way I like them: the crisp of the outside was nearly paper thin, yielding to the warm, soft, and sweet center that melted on my tongue. The shrimp were juicy and larger than I expected, and the garlic oil they were cooked in was not overbearing. It took all my willpower to not take the remaining oil in the bowl to the head, but I settled for using it as a dip for my remaining plátanos. Lopez opened MamaJuana in mid-December after nearly a year of planning and construction. His background is in concert production, first producing small shows at venues, and eventually he put on large functions with both live acts and DJs. This explains my constant urge to dance. Lopez says his family came together to help him in all aspects: his younger brother is the head chef who designed the menu, his older brother is an architect who designed the interior, and many family members helped with construction. Lopez says he'd like to expand throughout the city in the next few years. If he puts as much effort into the next venue as he did into MamaJuana, Rochester will be blessed. A closer look at that Garlic Shrimp Bowl. Ya welcome.